Sharjah: Grand Hypermarket, a retail group under the Regency Group opened its 52nd outlet Grand Mall, Mussalla, Sharjah. The inauguration was done by Ruler office chairman, Sheikh Salem Bin Abdul Rahman Al Qasimi in the presence of Sheikh Mohammed bin Abdullah Al Qasimi, Sheikh Abdullah bin Mohammed Khalid Ahmed Al Qasimi, Sultan Al Shamsi, Indian actor Suniel Shetty, DM Health care CMD Padmasree Dr. Azad Moopan, Regency Group chairman Shamsuddin bin Mohiyyudin, Group managing Director Dr. Anwar Ameen, Directors-Abdul Rehman A P, Abdul Subhaan bin Shamsudeen, Mohammed N V, Mohammed bin Aslam Mohiuddin, Silver Home Director V.T Saleem and government officials, socio-cultural dignitaries, Regency group regional directors, Management officials was witnessed by 1000s of happy customers. Grand Mall Sharjah located near Al Qarba Police Station, is the largest outlet of Regency Group in UAE. With a total buildup area of more than 200,000 sq. ft., the mall boasts huge parking space for 600+ cars in Ground and Basement level.Grand Hypermarket will act as the anchor tenant and the Mall will also have several shops with leading brands in Jewelry, Money Exchanges, Electronics & Mobility, Services, Watches and Fashion.The First Floor comprisesa department store that will house all major brands in Fashion, Electronics, Household, Garments, Footwear, Toys, and Accessories.A huge crowd gathered to avail the special inaugural promotions and prizes at the new outlet. Regency Group Chairman Shamsuddin bin Mohiyyudin, expressed his gratitude towards the rulers of the country, its citizens and expatriates on this occasion. “Grand Hypermarket will act as the anchor tenant and the Mall will also have several shops with leading brands in Jewelry, Money Exchanges, Electronics & Mobility, Services, Watches and Fashion. A food court area with seating capacity of 300 guests is also ready in the mall with Indian, Arabic and Chinese cuisines will open at the earliest. Kids will have a good time at the mall thanks to the spacious kids play area spread in an area of more than 2,000 sqft.” Said the Group Managing Director Dr. Anwar Ameen. The Management has informed that there will be a wide variety of offers for selected products, during the holy month of Ramadan. 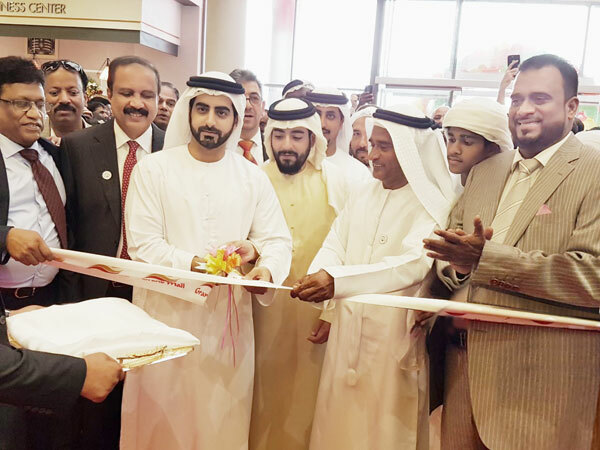 Photo caption: Grand Hypermarket, a retail group under the Regency Group opened its 52nd outlet Grand Mall, Mussalla, Sharjah. The inauguration was done by Ruler office chairman, Sheikh Salem Bin Abdul Rahman Al Qasimi in the presence of Sheikh Mohammed bin Abdullah Al Qasimi, Sheikh Abdullah bin Mohammed Khalid Ahmed Al Qasimi, Sultan Al Shamsi, Indian actor Suniel Shetty, DM Health care CMD Padmasree Dr. Azad Moopan, Regency Group chairman Shamsudeen bin Mohideen, Group managing Director Dr. Anwar Ameen, Directors-Abdul Rehman A P, Abdul Subhaan bin Shamsudeen, Mohammed N V, Mohammed bin Aslam Mohiuddin, Silver Home director Salim Valiakath, Government officials, Socio-cultural dignitaries, Regency group regional directors and Management officials.